Roleplaying games have taught me more than I'll ever fully realize. I'm sure everyone reading this blog would agree. One thing I'm sure I learned from RPGs (and not from paying attention in school) is the name of several strange forms of government, especially fuedalism and also many others found in the 1st Edition Dungeonmasters Guide such as theocracy, gynarchy and the fictional magocracy. Growing up in America in the 70's and 80's you'd hardly know there was anything other than democracy or communism in the world. To my delight I found the World of Greyhawk made use of alot of these obscure types of government. Take that, social studies! One of these words I've noticed, oligarchy, has been coming up an awful lot more in the last decade. First it was in reference to our old nemesis Russia. Since the Berlin Wall came down and the Soviet Union broke up, the word oligarch/oligarchy certainly applied to the wealthy business owners who now had all the influence afterwards. Here lately however, the media has been throwing out that word to describe the United States as well. As the link above shows, a country can be one system of government and still be an oligarchy. They're the power behind the throne so to say. And truth is often stranger than ficition. The Free City of Greyhawk is an oligarchy. Once ruled by Zagig Yragerne (magocracy?) and the Great Kingdom (fuedal), rulership of the free city is now in the hands of a fluctuating number of oligarchs called Directors. These Directors come from many walks of life, but largely they are all wealthy and powerful guild leaders or temple heads. The Lord Mayor is elected from within their ranks and serves an indefinite period. These positions aren't hereditary but they may as well be, since the oligarchs make sure that new members are handpicked from their own organizations or spheres of influence. In this fantasy setting it's no surprise then that organized crime has some of the highest seats at the table with military and religious leaders. So compared to Greyhawk City is the USA an oligarchy yet? Is that a bad thing? I'll let greater minds than mine draw distinctions. I'd also be happy to hear other examples of obscure government forms used in real life. Until next time, carry on. Awww yeeeeah! It's a new Dungeons & Dragons movie on Syfy! Dungeons & Dragons: The Book of Vile Darkness starts here soon, Saturday 9/8c. Judging from the trailer here, you won't miss much if you skip it, but having nothing better to do today I might just subject myself to this train wreck in the making to see if there is any vague Greyhawk references. Check out part of the synopsis. As a gamer, this sounds decent, until you see it played out live. Two thousand years ago, Nhagruul the Foul, a sorcerer who reveled in corrupting the innocent and the spread of despair, neared the end of his mortal days and was dismayed. Consumed by hatred for the living, Nhagruul sold his soul to the demon Lords of the abyss so that his malign spirit would survive. In an excruciating ritual, Nhagrulls skin was flayed into pages, his bones hammered into a cover, and his diseased blood became the ink to pen a book most vile. All those exposed to the book were driven to madness or so corrupted by the wicked knowledge contained within that they had no choice but to turn evil. So THAT is how the Book of Vile Darkness was made. Hah. Enjoy if you dare! I don't often go to ENWorld but I came across this story today. It seems someone working with the Gygax family has obtained the rights to the TSR name and is going to produce a gaming magazine in December. Before ENWorld checked into things this sign-up page was the only teaser for this project. I'll be keeping an eye on this, as always, with the slim hope that maybe some nostalgic remnants of Greyhawk might come to light. Otherwise, if this magazine is for real, more power to them. It is a daunting thing to run a magazine, heck even the highly regarded, award winning Kobold Quarterly folded its magazine days ago. I can't wait to see where this goes. 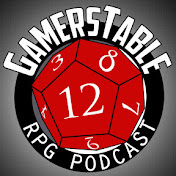 In case you've missed out, it's time to promote our twenty-second episode of the Castle Greyhawk graphic novel. Follow the link to read the entire story from the beginning with special additional content by author Scott Casper. Also you can read the current page compliments of Maldin's Greyhawk. Artist's commentary: This page was a bear to draw and I love it. Descending into the dungeon at last, I've been constantly tested with new angles, lighting tricks and my favorite thus far: flagstone walls, floors and ceilings. Scott has an eye for detail that makes even an empty room seem interesting. I am anxious as you readers are to see where this adventure takes us. 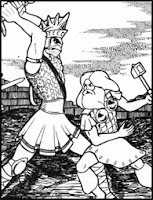 "Added to the collection is an all-new fifth adventure -- A0: Danger at Darkshelf Quarry -- that you can use to kick off an AD&D campaign that pits a group of adventurers against the evil Slave Lords! Module A0, designed for levels 1-3, sets the stage for events that unfold throughout the remainder of the "A" series." Darkshelf Quarry, eh? Great. I was on the fence about buying this book but now I'm too curious to pass it up. Anyhow, no word yet on who the head writer is on this intro-module. I'm personally hoping for Chris Perkins who has shown to have a good knowledge of the setting, having done reworks of the Giants series including a whole new episode for that epic as well. Stay tuned for more information on this in the near future (Thanks again). 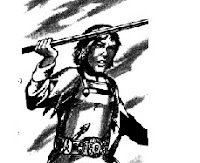 Looking back over the list of Greyhawk deities, I'm still amazed that Trithereon the Summoner was not more popular among fandom. Sure he isn't a C-lister like Jascar or Joramy, but he never was quite good enough for "Core deity" status either. As far as I recall no one I've personally gamed with has ever made a priest or worshipper of the god of retribution. What's worse, back in 3rd edition Wizards folded Trithereon's retribution portfolio into St. Cuthbert, further burying this quite cool god. Through my old World of Greyhawk Comic I used to explore the facets of many ignored gods like Trithereon. Undoubtedly his most interesting element is his notable animal companions. Trithereon is quite like the Beastmaster in this respect, a ranger-like vigilante bent on taking down evil with his animal cohorts serving useful roles. Here's another. I'm sure few remember from the 1983 Guide that Trithereon also has his own "prison" demiplanes. The colorful descriptions of these places always grabbed me. Imagine, what sort of villains are so evil that Trithereon and his pack has to go hunting after them? And rather than outright execute them, they are put in their own prison plane. Trithereon's prison planes predate the Ravenloft setting as well, so ponder that. I tried to tackle this issue in a Canonfire article on his demiplanes back in 2006. I consider this article among my best work, especially considering it isn't about Ull. So there you have it, check out Trithereon sometime when you're making a cleric for your Greyhawk campaign. Alright Greymaniacs, it's a slow week (and Election Day in the States) so I've got a good time killer for you. It's a simple map search. 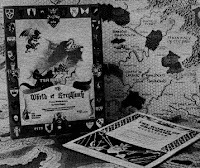 As most fans should know, the World of Greyhawk maps feature a unique set of coordinates along the top, bottom and sides that aid in finding locations on the hexagonal based map. These coordinates are similiar to those found in old school road maps. For younger readers, road maps were from the dark ages before the internet and GPS. Anyhoo, the game goes like this: I supply the coordinates and with your vast knowledge and collection of Greyhawk, you tell me what is at that hex in the comments section. Easy enough, or is it? Good luck! Attention grognards and Greyhawkers. Over at Wizards of the Coast they have a nifty quiz to test your knowledge of classic module covers. It's got two levels of difficulty too, Heroic and Epic. I got 13/17 on both. Those pesky Slaver modules always confuse me. Try it out, it's pretty fun.